Product information "Schwalbe Marathon Plus Tour"
In everyday life or on really big tour. The rugged design puts all the abuses away. 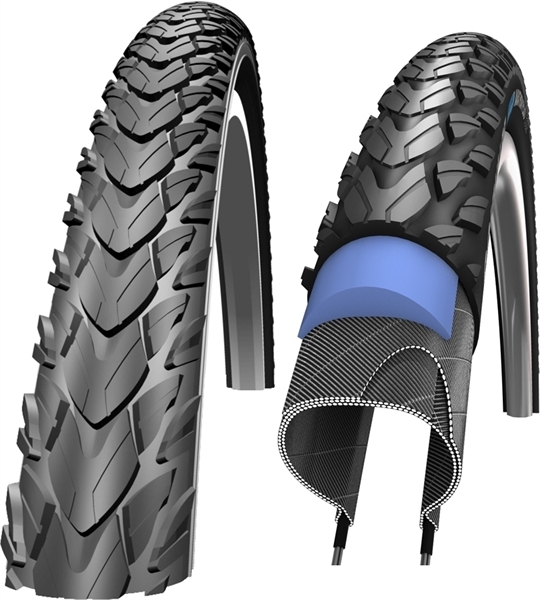 Surely by SmartGuard, the most effective protection belt that is available for bicycle tires. A substantial, 5 mm thick layer of flexible, special india rubber offers durable protection. SmartGuard has a crucial advantage especially with objects that lodge in the tread and that can be forced through almost any other protection belt by the rotation of the wheels. Here the SmartGuard has the advantage of thickness, because a thumbtack, for instance, simply remains in the rubber without damaging the tube. Related links to "Schwalbe Marathon Plus Tour"
Customer evaluation for "Schwalbe Marathon Plus Tour"